Happy New Year! It’s 1:30 am here, but I keep this blogging-every-day thing on EST. We spent the day at Montparnasse. I shot some little videos at the old and new train station and the cemetary so that my students could see where The Invention of Hugo Cabret takes place. I’m reading it with the 3rd graders from now until…whenever we finish it! Then we wandered around the area, debating whether to get on the very long line for the Catacombs. We did not. 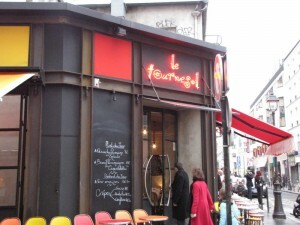 We did, however, eat at this great place called Le Tournesol. And I shopped at this very neat store called Mahasiah. Then we came back and got ready for the evening’s festivities. That’s where this NYE got interesting. After a 2.5 hour dinner (just 2 courses! ), we had very little time to get out to Montmartre. That’s where we planned to go to see the Eiffel Tower and the light show, but the trains were absolutely packed. And the platform we needed for that route was teeming with very young, very loud, very rowdy and aggressive folks. You could hardly move, shoving matches were happening, and people started playing with the escalators while we were riding them. Turning the power on and off so people kept slipping. And there was no way we would be getting on the already packed train, which couldn’t leave the station for the 10 minutes we were there because it was too packed to close the doors. So…we turned back. We actually rang in midnight on another train heading back towards the hotel. We headed to a spot on the river near Notre Dame, and we could see the Eiffel Tower. But the lights were over by then. Plenty of revelers and good cheer in the streets, though. Adam was disappointed about missing the lights, but I have to say I didn’t mind it. I’m not crazy about crowds, and it was fun just to wander around Paris in the middle of the night eating crepes and wishing people Happy New Year. So that’s 2009 on the books. I read a total of 298 books, 58 less than last year. I had less time on my hands than when I worked at a public library. I also blogged every day of 2009 except February 7th. That was right in the gap between Adam’s stepgrandmother passing away, her funeral, my 30th birthday party the night before, and my actual 30th birthday. Not too bad. I don’t know if I’ll blog every day in 2010, but I’m glad it’s here. Let’s get this next decade started already. It’s Official…We’re Going to Paris!